Which platform is most worthy of your monthly subscription? After the CD came the MP3, then the streaming subscription -- but where should you spend your £10 a month? For UK music lovers old favourite Spotify has recently been joined by the US-based Rdio and the France-based Deezer. Which offers best value for money? We tested out all three packages based on the higher £9.99 (USD $9.99, AUD $11.99) monthly subscription. Each service also provides a £4.99 (USD $4.99, AUD $6.99) plan that excludes mobile use. There are some variations with the Australian Dollar (AUD) pricing: Deezer is AUD $14.49 and $7.49 for each package and is not available in the US. 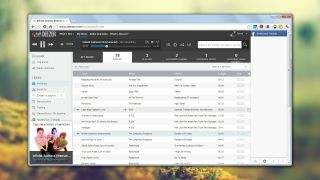 Rdio is AUD $12.90 and AUD $8.90 for each package. Spotify is the only platform that provides a free level, with listening limits and advertising, though both Rdio and Deezer offer free trials you can use to test the water. Spotify has always existed solely as a desktop client, though rumours from TechCrunch suggest the launch of a browser-based app is imminent. Perhaps this is due in part to the influence of Rdio and Deezer, which both run through a browser. Rdio also has a desktop app available, though it doesn't offer much more than the online version. All three services offer competent mobile apps for iOS, Android, Windows Phone and BlackBerry, though the Deezer app feels more rough around the edges than the other two. In addition, iPad-specific apps have been released for each of these services; Android tablet users have to make use with a one-size-fits all app, at least for the time being. In terms of mobile compatibility, all our contestants are on a level playing field, with Spotify just edging it for the most mature and classy client. Spotify is the oldest service here, and you'll find support for it baked into hardware like the Sonos speaker line-up and online platforms such as Tumblr. It also has an app eco-system of its own, though for us this doesn't really bring anything of particular use to the table. Spotify, Rdio and Deezer all support scrobbling to the popular listening history tool Last.fm. Rdio has recently revamped its interface and it's a real thing of beauty, particularly if you like a minimal approach (and pale blue). Spotify's app feels somewhat dark and foreboding by comparison, and could take a leaf out of Rdio's use of spacing and album art. Again, Deezer has a few rough edges -- a phrase that keeps cropping up with this service -- and there's something vaguely 80s about its appearance. Still, it's not a complete eyesore. Moving around all three apps and controlling playback is smooth and straightforward. There's little to choose between them for ease of use, though Rdio would be our winner for the cleanest, most intuitive interface, the one that beginners will be able to pick up the quickest. Assessing a catalogue of millions of tracks is difficult and more than a little subjective. All three services claim a catalogue of "more than 18m" tracks, though we found disparities, so it can't be the same 18 million songs. Artists such as Coldplay, Beyoncé and the Beach Boys are everywhere; digital hold-outs the Beatles and Oasis are nowhere. Where we did find gaps, it seems to be the smaller labels involved -- you'll be able to get a flavour of our music taste when we say Canadian rockers Arcade Fire and pop duo Sleigh Bells were on Deezer and Spotify but not Rdio, while Sufjan Stevens' latest LP is only on Spotify, and Pink Floyd (surprisingly) appear on Deezer but not the other two services. From our enquiries with press contacts, all of these services claim a maximum quality of 320kbps when streaming music. To our layman's ears, there isn't a great deal to choose between them, both streaming tracks and playing from the offline cache. If you have a serious music setup at home, you'll have to test Spotify, Rdio and Deezer in turn for differences in listening quality.